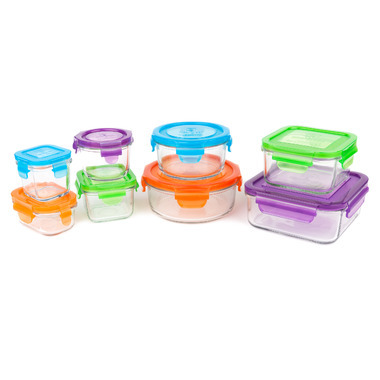 Stock your kitchen cabinets with all the tempered glass food storage containers you need! From leftovers to condiment storage the Wean Green Kitchen Set will have you covered. 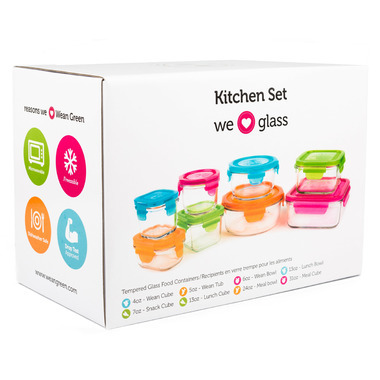 The Kitchen Set contains one of each Wean Green storage container: Wean Cube, Wean Tub, Wean Bowl, Snack Cube, Lunch Bowl, Lunch Cube, Meal Bowl and Meal Cube. I bought these as I was sick of having to replace plastic containers every few moths. I love these. Easy for my kid to open for school, durable and food tastes like how it is supposed to taste! These are nice to look at. The glass is thick and a good quality. The plastic lids aren't that great though. The snaps seem flimsy and one was even cracked off of the small containers when I took it out of the box. Good product. I hate plastic for the microwave, so I was happy to find an affordable glass alternative. My only concern (but not a show stopper) is with the rubber rings on lids. I like to remove them for washing and air drying as these types of lids (in my experience), can be prone to getting mold due to moisture getting in and behind the ring. They were a bit hard to pull out of the lid, but they did come out for washing.